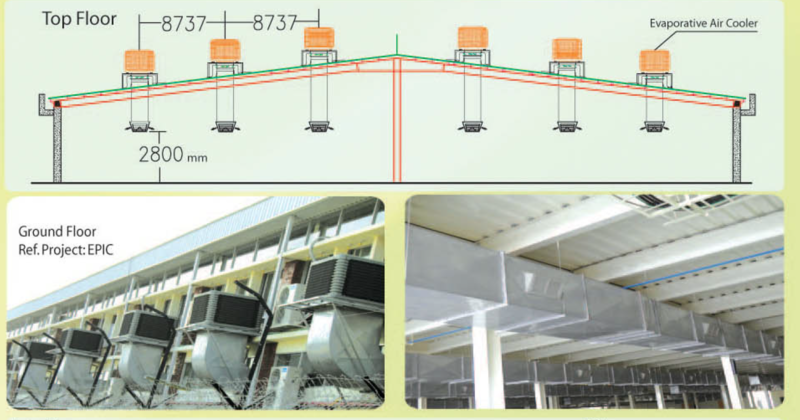 Evaporative Air Cooling Unit is applicable for the open and half open environment. It can directly convey natural air and cool air after reducing temperature. Outside fresh air can be conveyed largely after being filtrated and cooled down by the Evaporative Air Cooling Unit, and the inside odor & dusty air will be taken from the room. This Evaporative air Cooling unit can give attention to ventilation, temperature-descent and increasing the content of in the air. Evaporative Air Cooling Unit drops temperature through absorbing the heat in the air with water evaporation according to the principle of “water absorbs heat after evaporating, and the evaporative area affects the evaporating”. When the hot air passes through the cooling pad whose actual heat exchange area is 100 times of the surface area, the heat of the air will be absorbed, thus dropping the air temperature. Why Evaporative Air Cooling Unit?